The most exclusive and glamorous address will usher in to grace the luxurious lifestyle of the finest brings out the spirit of nothing but a glittering elegance only known to exist for the privileged few. This is an ultimate enclave for an heiress who just needs a vast walking closet for her ravishing haute couture gown and shoe collections. Rather, a perfect pad for a stylish gentleman who needs to have a home for his P20-million sports car. This is the “ultra high-end” living in Mckinley West’s luxury residential estates, creating a between innovation and refined tradition as it sets a new benchmark on the way Metro Manila’s A -listers should live. The pure opulence radiated from the exclusive row of luxury residential estates inside Mckinley West, Megaworld’s first ultra high-end community in Fort Bonifacio adjacent to Forbes Park and the Manila Polo Club. Megaworld brings this exceptional exclusivity in the quiet side of Fort Bonifacio with its own blueprint that has a class of its own, orchestrated by a unique collaboration of the world’s leading European architects and designers, and award-winning home innovators. “Mckinley West’s luxury residential estates will deliver luxury beyond expectations as we bring together the master-pieces of Europe’s best home and design comapanies” reveals Noli D. Hernandez, senior vice president, Megaworld. Responding to the unique modern European home inspiration, Megaworld has commission UK-based architectural firm, Broadway Malyan, to bring their expertise in developing the luxury residential estates of Mckinely West. With over 500 design experts all over the world, Broadway Malyan brings global architecture urbanism and design in 43 countries in Europe, North and South America, Africa, Middle East and Asia Pacific. The award-winning company has received 240 awards since it was founded in 1967 for its iconic designs of residential, office, healthcare, education and hotels in different parts of the world. Broadway Malyan’s design for the luxury residential estates in Mckinley West will be highlighted by modern Europe, similar tot he world’s most expensive homes in London. With choices of two to four bedroom suites of up to 400 sqaure meters in floor area, the estates will feature utmost privacy and security for all estate owners. Expansive penthouse suites feature two-levels of exquisite living with floor to ceiling all-glass windows and the privacy of your own indoor infinity pool. An exceptional collaboration with three top European luxury brands for home design and fixtures will be a major highlight of these luxury residential estates. 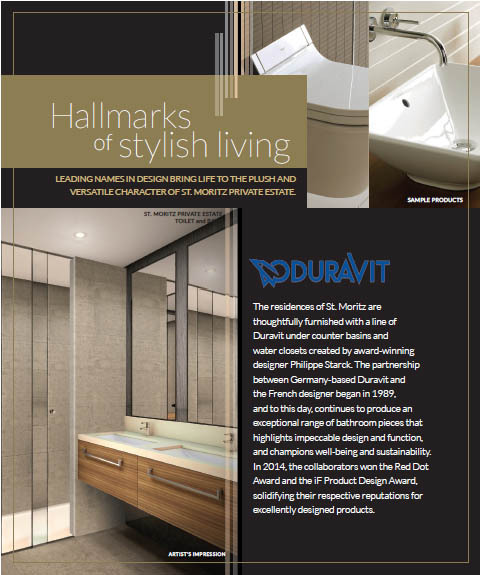 Each suite of the residential estates will feature the award-winning design pieces of Philippe Starck from Duravit for bathroom and toilet; the energy-saving and eco-friendlu built-in home appliances from Bosch, and the sophisticated kitchen fixtures from German luxury brand, Leicht. These top internation home brands are among Europe’s most awarded and most admired companies for luxury home innovations. “This collaboration with world-renowned European brands indeed makes living in Mckinley West a rare privilege only for the chosen few,” explains Hernandez. Located on a 34.5-hectate former JUSMAG property, Mckinley West is Megaworld’s first ultra high-end master-planned community beside the elite village of Forbes Park. Spending P45-billion in the next 10 years to build Mckinley West, Megaworld envisions Mckinley West to be a luxurious blend of a modern business district and posh residential enclaves. The township’s residential distrivt, where the village and the estates are located, will have its own exclusive access for residents. Lawton Avenue, the main road fronting the township, will be expanded to six to eight lanes, through the efforts of the Bases Conversion and Development Authority(BCDA). The township will also have direct access to Mckinley Hill, another Megaworld development. This allows more convenient access to Bonifacio Global City, South LuzonExpressway, C5 Road, the Ninoy Aquino Internation Airport and Mckinley ROad towards Makati CBD.